• PLOT SUMMARY: "Love Hurts" - BLACKEST NIGHT continues! The Black Lanterns descend on all the Corps throughout the universe! 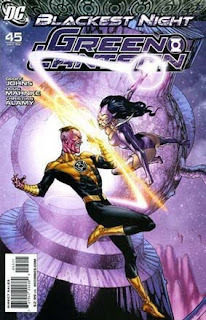 Sinestro's assault on the Star Sapphires' homeworld of Zamaron is interrupted by another Sinestro Corps - one made up of those who died during the Sinestro Corps War! And while the War of Light flickers, deep in the darkness of space, John Stewart comes face-to-face with his deceased wife - and longtime Green Lantern - Katma Tui. Written by Geoff Johns. Pencils by Doug Mahnke, inks by Christian Alamy, Mahnke & Tom Nguyen. Cover by Doug Mahnke & Christian Alamy.